Pablo Picasso is an artist with totally recognizable style. He’s one of those artists that pretty much everyone is somewhat familiar with, and catches your eye in an interesting way. Sure, some might not think his stuff is that great or really worth all the attention, but what I love about his paintings are the simplicity of his shapes and forms, making his artworks seem almost childlike. And what’s great about that is kids of all ages can appreciate his work. It’s not overwhelming or challenging. It is what it is. For some kids, they just see lines, shapes, and colors, while others might see the emotion, balanced composition, and the inner drive that pushed Picasso to paint more, and more, and more. Picasso created many different creations over his life and to concentrate on just one image is almost impossible. But, one can take a closer look at part of his style – which was the use of dark, strong lines. Sometimes those lines cut women in half, depicted sad scenes, or just shapes found in everyday life. 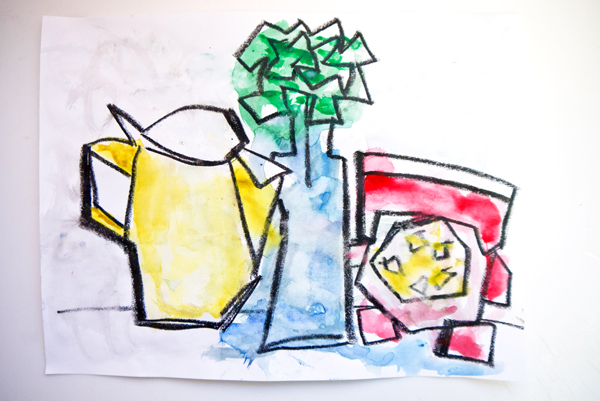 Your child can learn more about Picasso while using his technique of outlining by creating a whimsical and interesting outline still life. Start by taking a closer look at some of Picasso’s artworks and talk about all the interesting things your child sees within them. 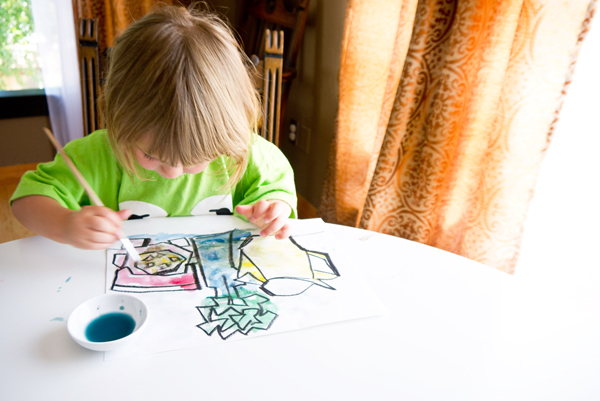 Even if he’s not sure what’s happening, talking about art and art concepts encourages creativity in your child and shows you value his opinions. See if he can find one artwork he feels connected with and explore it further. My tot is a bit young for creating strong, bold lines, but kids aged four and up can totally get into this art experience. Invite them to go on a scavenger hunt searching out three interesting objects for creating a Picasso inspired still life. Picasso created tons of paintings depicting random items, like vases and fruit. Take a closer look at one of my favorites, Pitcher, Candle and Enamel Saucepan, for some inspiration. 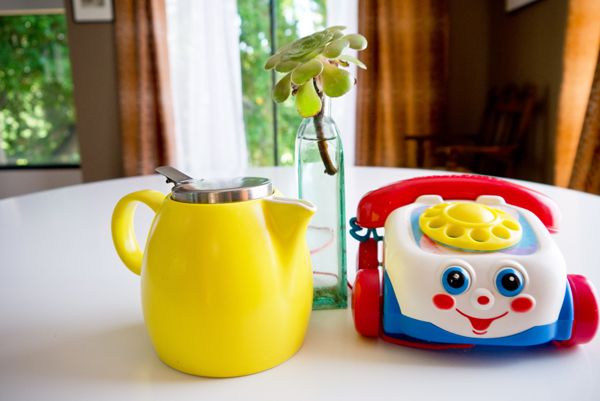 Now invite your child to arrange the three objects in an interesting way for creating his outline still life. He can line them up in a row or in a random grouping. Offer your child a black crayon along with a ruler to begin making his dark, strong outlines. Picasso often used angular lines, or ones that had edges. He also explored the beauty of using organic, or curving lines. Encourage your child to take his time and think about angles, balance, and composition. He can use the ruler to make sharp, angled edges and free draw organic, curving ones. I helped my tot make the outlines for her Picasso inspired creation, but knew she could do the next step on her own. Once he’s happy with his outlines, he can use watercolors to add bright, vibrant color. I offered my daughter a few selections of watercolor paints in small containers and invited her to add dabs of color on the paper, coloring in the exciting still life. Encourage your child to do the same – he can use realistic colors or get creative, painting his still life with any colors he likes. After he’s filled his paper with paint, compare the real life still life with his Picasso inspired outline creation. How do they look?